Would you like your teeth to look youthful and bright? Have you had your teeth professionally whitened and desire to continue that great look? Drs. Deborah Romack and Garrrett Mulkey, your Weatherford dentists at Cosmetic & Family Dentistry, tell patients that many of the everyday foods they enjoy discolor tooth enamel. Moderately consumed, these foods are fine when balanced with those that improve the look and health of tooth surfaces. Dark-colored foods– whether natural or processed– stain enamel. While our tooth enamel starts out rock hard, it gradually softens and breaks down, becoming porous and easily discolored. However, even young people with less porous teeth get stains when they consume foods and beverages with a lot of acid (such as carbonated sodas, tomato sauce and sports drinks). Your Aledo dentists warn that these foods and beverages contain molecules called chromogens which allow stains to adhere to tooth enamel. They recommend limiting the amounts consumed, and in the case of a dark beverage such as iced coffee, drinking it through a straw. Rinse the mouth with water right away, and of course, brush twice a day and floss daily. Also, carbohydrates form plaque on tooth surfaces and in interdental spaces. Oral bacteria grow well in plaque, secreting acids that wear enamel and retain stains. Staph aureus is the microorganism which causes tooth decay. To counter the negative, the dentists at Cosmetic & Family Dentistry recommend adding more healthy foods to your daily diet. Drinking 8 glasses of water a day (64 ounces) assists weight control, washes tooth enamel and encourages saliva production. Saliva whitens teeth and is antibacterial because of its digestive enzyme content. Citrus fruits, such as oranges, lemons, limes and grapefruit, while acidic, contain lots of beneficial water. Other tooth healthy choices include fibrous fruits and veggies such as pears, carrots, cauliflower, apples and celery. Broccoli and pineapple possess great anti-inflammatory properties and a fibrous texture that scours teeth. Lastly, low-fat dairy products contain calcium that mineralizes enamel. Pick hard cheese, such as cheddar, milk and yogurt. Would you like to know more about what you should eat to maintain a healthy, white smile? Contact Cosmetic & Family Dentistry in Weatherford to arrange your cosmetic dentistry consultation. Learn about Zoom! 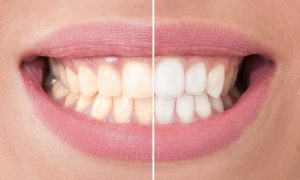 in-office and at-home teeth whitening in Weatherford or Sinsational Smile, an effective, 20-minute whitening option.